SCOR’s highly experienced teams of Life & Health experts and professionals are dedicated to providing clients with innovative approaches and solutions to help them succeed in their diverse markets worldwide. Best-in-class underwriting, claims management and product development are at the core of our multi-faceted service offering. We also develop and encourage ongoing research in actuarial science, to contribute to the improvement of risk knowledge and risk management through our established R&D centers across the globe. Our Life & Health division’s underwriting experts help clients to make the most effective risk decisions in their underwriting of applicants, with strong selection strategies in medical, non-medical and financial fields. SCOR’s risk management and claims services experts work with clients to help identify high risk levels, spot substandard risks, determine the conditions under which to accept certain risks, and limit adverse selection. 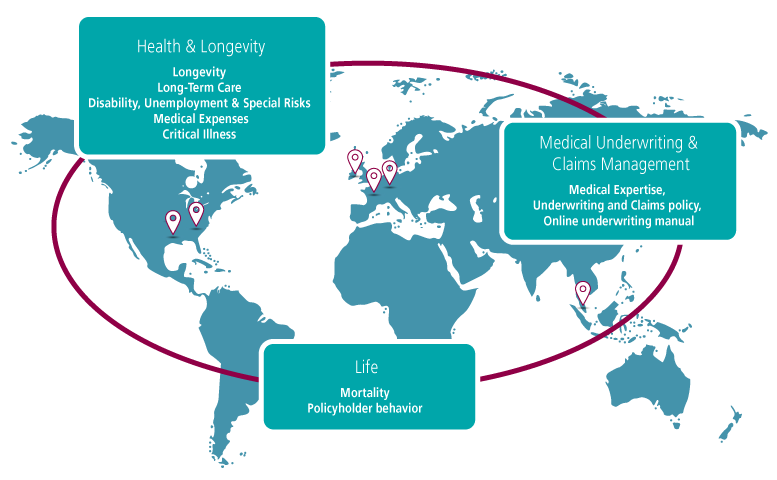 SOLEM, a comprehensive underwriting and claims guide developed by SCOR, is helping our clients throughout the world to better assess medical, occupational, sports, financial, residence and travel-related risks. It also has a section devoted to claims management. It includes guidelines for a large range of different insurance products such as Life, Disability, Critical Illness, Long-Term Care and Medical Expenses, with easy-to-understand rating tables. SCOR has a long track record and proven expertise in helping insurers to develop, price and launch new Life insurance products. With extensive knowledge of local markets and a global presence, SCOR works closely with its clients to develop innovative products for their markets covering Mortality and all key risks, such as Disability, Critical Illness, Long-Term Care, Personal Accident and Medical Expenses. SCOR's Life and Health division constantly strives to enhance its understanding and knowledge of risks in its 7 R&D centers spread across 6 cities: Paris, Dublin, Cologne, Singapore, Charlotte and Kansas City. Each R&D center is dedicated to a specific biometric risk such as Mortality, Critical Illness, Disability, Long-Term Care, Medical Expenses and Longevity, or to a key driver such as policyholder behavior, medical underwriting and claims management. The R&D centers have established partnerships with top researchers and academic institutions recognized as authorities in their given fields. These partnerships enable the R&D centers to utilize a wide range of expertise, thereby enhancing our risk assessment capabilities. Our R&D centers share some of their findings through publications and seminars on current topics such as cancer screening, HIV infection and breast cancer.